Maybe it was the early press shots of a hirsute Justin Vernon, forlorn in brownish plaid flannel and a tangerine knit hat, that led to a misguided impression that the Bon Iver frontman was mostly a folk or indie rock guy, isolated in a cabin with an acoustic guitar. But following the release of 2007's For Emma, Forever Ago, he swiftly dispelled that notion via very different, collaborative Volcano Choir or Bon Iver releases, like 2016's 22, A Million, which was willfully as abstruse (and mysteriously mathematical) as a Boards of Canada album. Engaged with music that's atmospheric, expressive, and sometimes stubbornly challenging, Vernon thrives on abrupt left turns, leading him towards hip hop, ambient terrains, or electronic deep dives. The same can be said for the National's Aaron Dessner, who has restlessly drifted down innumerable paths since the inception of his core band; he's been happily engaged over the years with a Grateful Dead tribute, Icelandic performance art, and modern classical collaborations with visual artist Matthew Ritchie. 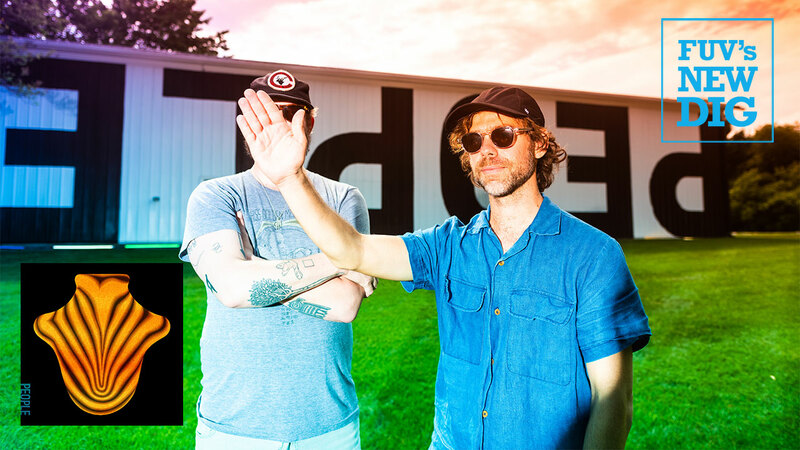 Dessner's artistic wanderlust has led him to the Brooklyn Academy of Music's Next Wave Festival and the genre-blurring Eaux Claires Music & Arts Festival, which he co-curates with Vernon. So the connection — and inspiration — forged when Vernon and Dessner recorded one track together, "Big Red Machine," for the Red Hot Organization's 2009 charity album, Dark Was the Night, seemed the beginning of a beautiful friendship in songwriting. Although that particular track hewed more towards modern classical, lush with strings and melancholy, the jittery piano that underscored it hinted at something far more provocative. It's taken nearly a decade, but Dessner and Vernon have finally transformed that first Big Red Machine spark into a proper, album-length bonfire. With the first glitchy thrum and sigh of "Deep Green," or the cheerfully profane "Gratitude," the duo have set down a path strewn with surprises; the songs' arrhythmic clicks, pulses, and scratchy warbles are right up Aphex Twin's alley. An abstract metaphor of the heart — that big red machine — stutters and swoons through all ten tracks. This isn't just a lone venture between Vernon and Dessner either, but developed via the pair's PEOPLE digital platform, born two years ago at Berlin's Michelberger Music gathering and rounding up a roster of collaborative cohorts for Big Red Machine, like producer Brad Cook, Lisa Hannigan, the Staves, This is the Kit's Kate Stables, Phoebe Bridgers, jazz drummer JT Bates, Dessner's own bandmates in the National, and many others. The journey of Big Red Machine vacillates between eager experimentation and a more meditative space. On the gorgeous "Lyla," the gospel-soul sweep of a sweetly-sung chorus is jerked to a halt by Vernon's hoarse command, "Scratch that," as if the song were being conceived, and rethought, in that very moment. Thereafter, track rolls on, deliciously melting for minutes more into a dreamy, boundless, funked-up walkabout of at least a half dozen ideas elbowing for space. "Hymnostic" lives up to its spiritual name, strands of its grand, piano-driven mission, even subtly straying down a Levon Helm and the Band byway, while the brooding bassline of "Forest Green" ambles throughout the song's gentle drift like a thoughtful companion. Lyrically, Vernon opts for the more cryptic, leaning towards romantic rumination at times, but words here are percussive too: vocal tics, sighs, capitulations, stinging swears, and bullet points. The frequent repetition of phrases soothe and worry like prayerful mantras while outwardly incongruent interjections, like a high-pitched bark of "Snakes! Lovers!" in "People's Lullaby," can prompt a song's very transformation. The most straightforward track is "I Won't Run From It," an affirmation of recovery from devastation, touched with dusty bluegrass. "It's a very hard thing to have grief," Vernon muses at song's end. "Ah, give it a minute, we're dancing in it." Big Red Machine isn't made for quick assessment, but dedicated listening. Vernon and Dessner's evocative tangents, song by song, ask for the time to absorb what they are doing. Genre-resistant artists like Burial, Anna Meredith, Flying Lotus, and Nils Frahm are constantly forging fresh paths that intersect forms in electronic, classical, hip hop, and rock music, and here, Vernon and Dessner are doing the same. They might be throwing a lot of disparate ideas into the mix, finding cohesion and discovery in the moment, but the results are are downright stirring, uplifting, and undeniably beautiful. Below, listen to Carmel Holt's recent conversation with Aaron Dessner at Long Pond Studio, discussing "Deep Green," "Forest Green," and "I Won't Run From It," as well as the origins and goals of the PEOPLE collective.